Karishma Kusurkar is an award-winning Multidisciplinary Designer based in Belfast, United Kingdom. Having studied at the Belfast School of Art & University of the Arts, London, Karishma established her own studio in Belfast 2014. 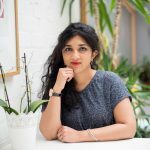 Karishma has collaborated on several ventures including The Design Salon & Belfast Design Week which continue to develop and grow their audiences year on year. She is currently working on an international collaboration called A Tiny History and local collaboration People Make Design. She is also co-founder and designer of the Small Town Big Dreams podcast which champions entrepreneurs in the creative industries. Karishma is keen on developing strategic ties between the creative industries and entrepreneurship, business, culture and tourism.